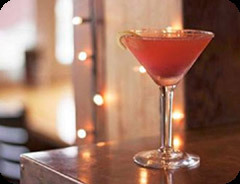 Flow Restaurant & Lounge - A Mendocino restaurant where exquisite ocean views pair with delicious dining. 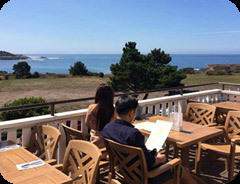 A Mendocino restaurant where exquisite ocean views pair with delicious dining. f rom our outdoor patio or indoor dining room. "With a central location in one of the many water towers you'll see around Mendocino proper, this all-day option serves farm-to-table eats with creative twists. For example, tart coconut pancakes at breakfast, and tenderloin tasters — small cuts sauced three different ways (creamy caper sauce, pesto blue cheese and a red wine mushroom sauce) — on the dinner menu. Choose to dine on the outdoor patio with raised coastal views of Big River Bay or inside a dining room encased in glass where you can enjoy the outlook sans the foggy chill".